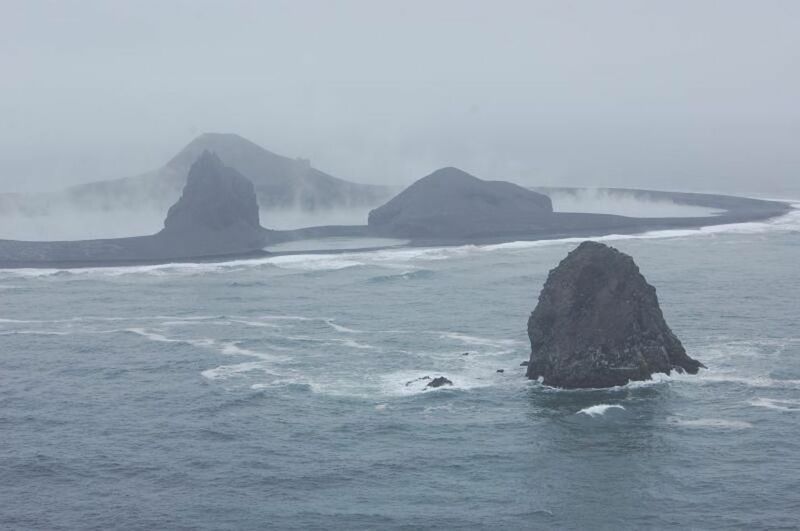 Alaska's most active volcano, the tiny and tempestuous Bogoslof, erupted again over the weekend, the latest installation in a geologic drama that has been playing out on this remote island in the Bering Sea since December. Saturday's eruption was "probably in the top half as far as size" of the recent cycle of eruptions that started in December, said Michelle Coombs, a scientist with the U.S. Geological Survey's Alaska Volcano Observatory in Anchorage. It lasted for about 45 minutes, producing volcanic lightning and an ash cloud rising to at least 35,000 feet, prompting the observatory to issue a "red" aviation warning, the highest level, the observatory reported. The alert has since been downgraded. Drifting clouds of ash can threaten air traffic, including jets crossing the Pacific Ocean. The wind pushed most of the ash cloud north to open Bering Sea waters, Coombs said. No reports of aviation problems arising from the ash cloud have been received, she said. 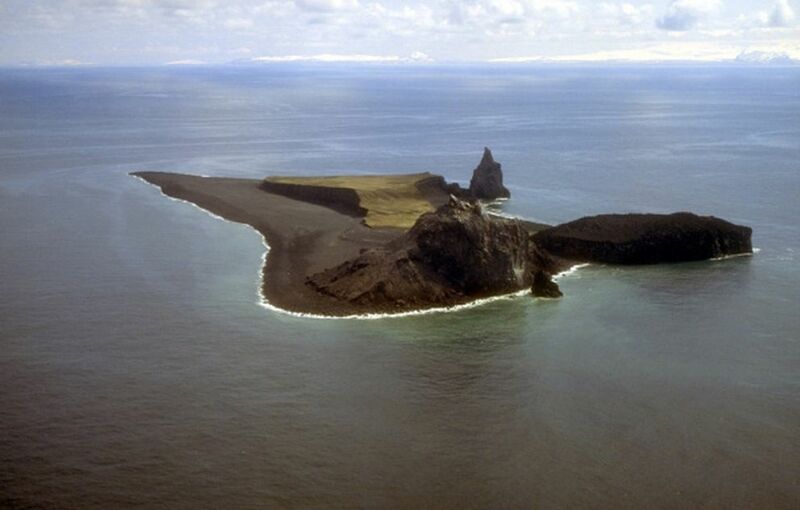 Bogoslof is a tiny sliver of an island that lies 60 nautical miles west of Dutch Harbor. Less than a kilometer across, the island is the tip of a much larger underwater volcano. Saturday's eruption "kind of came out of the blue," said Coombs. 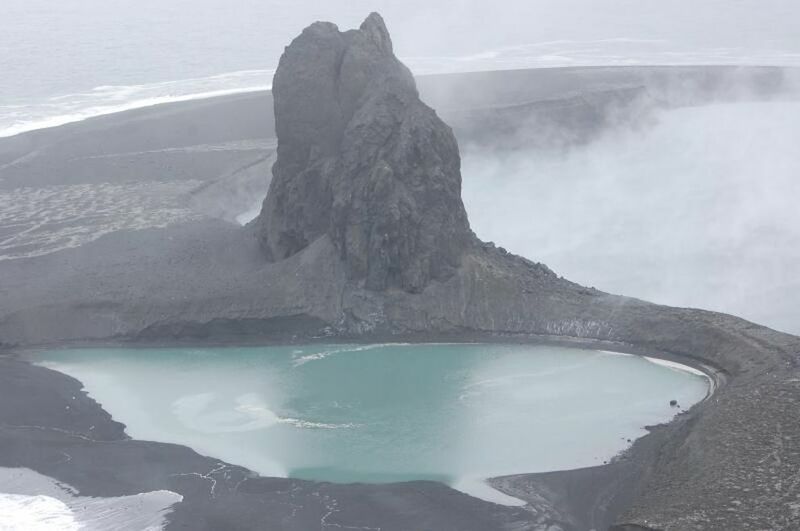 That's usually the case with Bogoslof: While the volcano has been in an active eruption cycle since December with some 40 volcanic "events" detected, scientists can't put monitoring equipment directly on the island. The island — a constantly shifting landscape of black lava, rocky beaches, and vegetation of only grasses, sedge and heath — is so small and the volcano so active that sensitive instruments researchers use to monitor volcanic rumblings can't be placed there, posing unique challenges for researchers trying to track its activity, Coombs said. "If we'd had instruments out there, they probably would have been destroyed 40 times over by now," she said. The island is also designated wilderness managed by the U.S. Fish and Wildlife Service, home to sensitive seabird, fur seal and sea lion rookeries. Researchers must rely on instruments, placed on neighboring volcanoes, that can detect seismic changes that herald an impending eruption but not nearly as precisely as if they were on Bogoslof itself. That means scientists know about the eruption as it's already happening. "We prefer to be in forecast mode with volcanos," said Coombs. "But because (Bogoslof) is unmonitored, we're basically detecting the eruption." Biologists with the U.S. Fish and Wildlife Service and researchers with the volcano observatory regularly visit the island. "Given the unpredictability of the volcano, we have pretty much canceled any plans to visit this field season," Coombs said. "It's a tiny little island, and we don't have capability to forecast the eruption." If Bogoslof were to go off with researchers on the island, "there would be nowhere to hide," she said. Past eruptions have carved new shelves and spires of land. As of February, the eruptions that started in December had tripled the island's size. In May, a newly formed, steaming hot lake was captured by a U.S. Coast Guard flyover. "For the first two months, the explosions were very regular," Coombs said. "They were happening once every one or two days." Then Bogoslof went quiet for about two months. A smaller eruption happened in mid-May. "I wish I could say what the pattern is," Coombs said. "But it's not clear."